Le Tour Eiffel: its long travelling frame, open base and strong horizontal lines captures the essence of Paris. Incorporating this Parisian landmark and taking inspiration from Celeste's Lacy Little Top, I fashioned The Eiffel Top. The next step was to integrate a DK weight yarn to create a delicate and intricate lace design and something that would be fun and reasonably quick to knit. The 100% hemp yarn was integral to this design as it is meant to skim the body and hemp provided the perfect drape needed. The Eiffel Top is form fitting on the upper body and arms., while velvet ribbon is threaded through sleeves and empire line creating a romantic silhouette. This top will be perfect to wear during the festive season and well into the New Year. It is essential to block your gauge swatch in order to achieve an accurate gauge measurement! 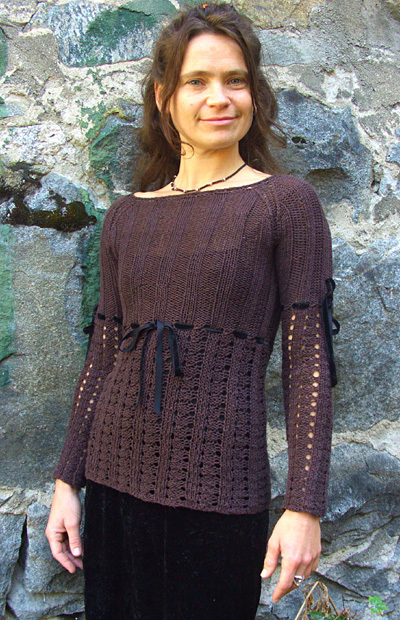 While you are knitting this top, it will look very small (see photo at right). The fabric will relax dramatically during blocking. Note: The number of sts in each repeat will increase to 8 in Round 3 of the pattern, but will be decreased again to 7 in Round 4. Rounds 1 & 2: [K2, p4, k1] to end. Round 3: [K2, yo, p1, p3tog, yo twice, k1] to end. Round 4: [K2, p4, drop second yo of double yo from left needle, k1] to end. Round 1: P2, [k3, p4] to last 5 sts, k3, p2. Using smaller circular needle, CO 126[140, 154, 168, 182, 196, 210] sts. Place marker and join to begin working in the round, being careful not to twist. Work in Lace Rib pattern until work measures 1 inch. 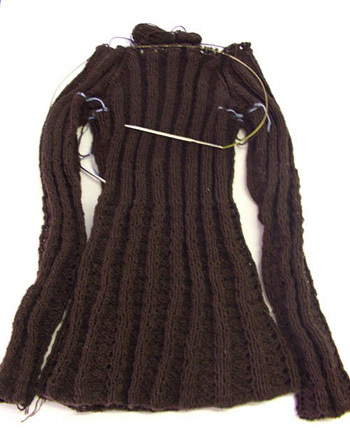 Change to larger circular needle and continue in Lace Rib until work measures 9[10, 10, 11, 12, 12, 13] inches. Next Round: Remove marker, k2, p2, replace marker - this point is now beginning of round; work next 63[70, 77, 84, 91, 98, 105] sts in 3x4 Rib, place second marker to indicate side "seam"; work to end in 3x4 Rib. Continue in 3x4 Rib until work measures 13[14, 15, 16, 17, 17, 18] inches, or desired length to underarm. Next Round: Work in patt to side seam marker, work next 6[6, 7, 7, 7, 8, 8] sts, place last 12[12, 14, 14, 14, 16, 16] sts worked on hold on waste yarn or st holder, removing marker; continue in patt to last 6[6, 7, 7, 7, 8, 8] sts, place last 6[6, 7, 7, 7, 8, 8] sts of this round and first 6[6, 7, 7, 7, 8, 8] sts of next round on hold on waste yarn or st holder, removing marker. Do not break yarn. Set work aside and knit Sleeves. Using smaller double-point needles and a new ball of yarn, CO 35[35, 42, 42, 42, 49, 49] sts. Divide between needles so that each needle has a multiple of 7 sts (for ease of working st pattern). Join to begin working in the round, being careful not to twist. If desired, use a split ring marker or safety pin to mark end of round. Change to larger circular needle and continue in Lace Rib until work measures 4 inches. Note: Read ahead to end of Sleeve before proceeding; shaping instructions and stitch pattern instructions are worked at the same time! Increase Round: K1, m1, work in patt as set to last st, m1, k1. Work 6 rounds in patt as set. Repeat these 7 rounds 6[9, 9, 9, 9, 9, 9] times more, working new sts in 3x4 Rib pattern. 49[55, 62, 62, 62, 69, 69] sts. Increase 1 st at beginning of next round. -[56, 63, 63, 63, 70, 70] sts. AT THE SAME TIME: When work measures 13[13, 12.5, 12.5, 13, 13, 14] inches, discontinue Lace Rib and begin working in 3x4 Rib. When increases are complete, place st marker after 4th[1st, 1st, 1st, 1st, 1st, 1st, 1st] st to mark new beginning of round; this should fall directly in the center of a [p4] rib. Continue in 3x4 Rib until work measures 18[18, 18.5, 18.5, 19, 19, 20] inches, or desired length to underarm. Note: If you want your sleeves to be shorter or longer, make the adjustment in length when working the Lace Rib section. As written, the 3x4 Rib section of the Sleeves will be 1 inch longer than the 3x4 Rib section of the Body, which will allow these sections to line up attractively when worn. Next Round: Work to last 6[6, 7, 7, 7, 8, 8] sts of round, place next 12[12, 14, 14, 14, 16, 16] sts on hold on waste yarn or st holder, removing marker. Break yarn, leaving a 1-yard tail. Place remaining 37[44, 49, 49, 49, 54, 54] sts of first Sleeve on hold on smaller circular needle, and make a second sleeve to match. After placing underarm sts on hold, do not remove remaining sts of second sleeve from needles. Place marker, K37[44, 49, 49, 49, 54, 54] sts of one Sleeve, place marker, k51[58, 63, 70, 77, 82, 89] sts of Front, place marker, k37[44, 49, 49, 49, 54, 54] sts of second Sleeve, place marker, k51[58, 63, 70, 77, 82, 89] sts of Back. You should be back at the first marker. 176[204, 224, 238, 252, 272, 286] sts on needle. The held underarm sts of the Sleeves and Body rest opposite each other. Work 7 rounds in 3x4 Rib as set. Decrease Round: [P1, ssk, work in patt as set to 3 sts before next marker, k2tog, p1] 4 times. 8 sts decreased. Next Round: [P1, k1, work in patt as set to 2 sts before next marker, k1, p1] 4 times. Repeat these 2 rounds 9[11, 13, 15, 16, 18, 19] times more. 96[108, 112, 110, 116, 120, 126] sts remain. Work band using smaller circular needle. Round 3: [YO twice, k2tog] to end of round. Round 4: K all sts, dropping second yo of each double yo from left needle. Round 5: P all sts, removing markers. BO Round: [K2tog tbl, slip st just worked from right needle to left needle] until 1 st remains. Break yarn, draw through last st and pull tight. Use yarn tails to graft held underarm sts of Body to held underarm sts of Sleeves. Weave in ends. 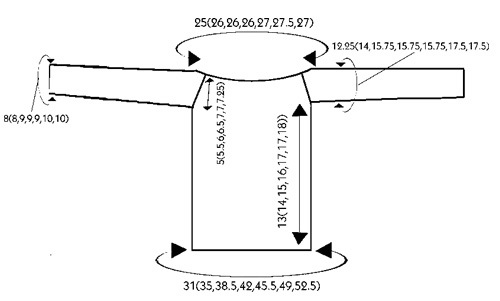 Wash and block to measurements shown in schematic. completely dry, reshape it and lay flat to dry. Hemp will continue to soften with each wash and dry. Adding regular hair conditioner to the final rinse will add softness to the hemp. Measure circumference of chest, just under bustline. Cut a piece of ribbon approx. 30 inches longer than this measurement. Measure circumference of upper arm, several inches from underarm. Cut two pieces of ribbon approx. 30 inches longer than this measurement. 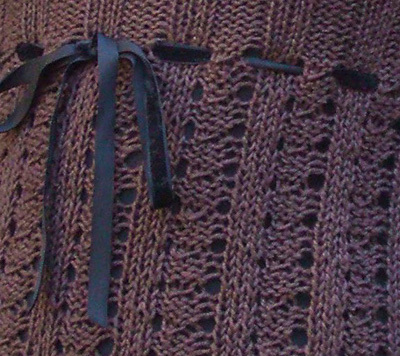 Thread ribbon through top rows of eyelets on body and sleeves of sweater (see photo). 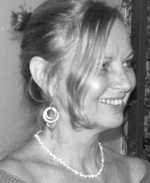 Lana Hames is a knitwear designer who is dedicated to promoting hemp yarns. She has created Lanaknits Designs hempforknitting, a company where she designs classic knitwear exclusively using hemp and has developed a line of hemp yarns that are perfect for hand knitting.